Syzygy Information Services Company was established in 1997 by four founders and specializes in software localization and testing. The language pairs we mainly provide are English to Traditional Chinese and English to Simplified Chinese. Started with Corel, Microsoft and IBM Lotus software localization, now we work with global top 100 companies for almost 20 years. 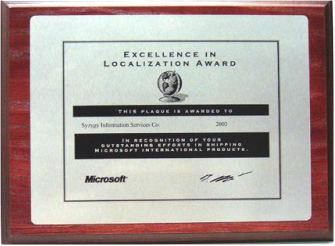 And in 2003 we received "Microsoft Excellence in Localization" award from Microsoft for our excellent translation quality. Our excellent teams and agile project management workflow can help you to deliver top quality software, website, and technical document. ​SYZYGY: /ˈsɪzᵻdʒi/ (astronomy) means a straight line configuration of three ​celestial bodies. In our company, our core values are "Language", "Management", and "Technology". Copyright © 2017 Syzygy Information Services Co., Ltd. All rights reserved.